Investment commentary helps asset managers to attract and retain clients. Clearly explaining how you view the investment environment and the sources of your portfolios’ returns gives your clients and prospects confidence that you can reproduce good performance and bounce back from underperformance and difficult market conditions. It also shows that you understand your clients’ concerns and care about satisfying their information needs. Your insights can help you to stand out. I. Organizing Your Thoughts—organizing your ideas will make you more efficient and effective once you start to write. In this section, I share examples of how to organize your commentary and what to include. II. Editing for the “Big Picture”—you’ll save time and produce better comments if you edit first at the “big picture” level. Otherwise, you may waste time tweaking punctuation and usage for text that drops out of your final version. I find the first-sentence-check method particularly powerful for identifying and fixing poorly organized text. III. Editing Line by Line—once the commentary works, it’s time to eliminate errors of punctuation, spelling and usage that can distract your audience, causing them to stop reading. IV. Getting More Mileage Out of Your Commentary—you invest a lot of time in creating your commentary, so share it with a broader audience to improve your ROI. The book is in PDF format and costs $9.99. 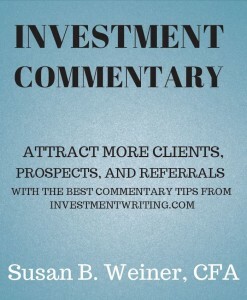 Susan’s Investment Commentary book is a must-read. Anyone who writes investment commentary and financial reports should read—and reread this book—in order to avoid the dry, boring reports we see all too often.